Overnight campers and avid fishers will find Kinaskan Lake to be the perfect spot to stop and relax. The campsites provide a spectacular introduction to northern scenery. From the campground, located at lake’s edge, visitors are afforded sweeping views up the length of the lake with Todagin Mountains to the east and the Klastline Plateau to the west. 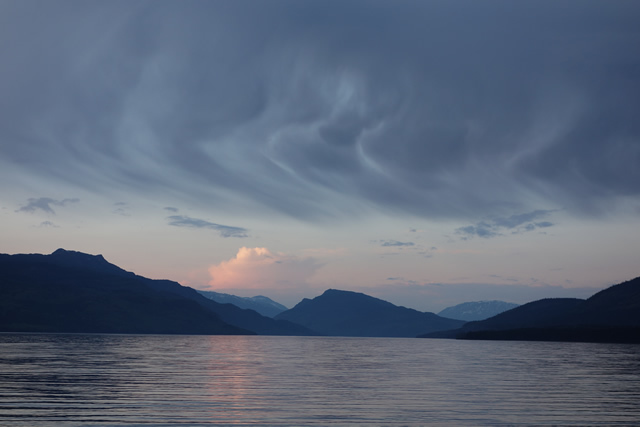 Located at the south end of Kinaskan Lake between the Skeena and Coast Mountain Ranges, this park offers spectacular scenery and good rainbow trout fishing. The Iskut River runs through the park to the south, where it enters a smaller lake called Natadesleen. The Little Iskut River branches off to the west into Mt. Edziza Provincial Park and Recreation Area. Maintenance, fee collection, and security services for the park are provided by a Park Operator. This applies to all areas of the park including the campground, Natadesleen Lake and trail, and the section of the Iskut River within the park boundary. Please ensure you are familiar with the location of park boundaries before hunting in the vicinity of the park. Please keep vehicles and equipment on the camp pads or driveways. Unlicenced vehicles, including all-terrain vehicles and snowmobiles, are not permitted in the park. You can canoe or boat the Spatsizi, Klappan, Stikine, or Dease Rivers, drive to viewing opportunities in the Lower Grand Canyon of the Stikine near historic Telegraph Creek, or in alpine through Gnat Pass. About 330 km north of Kitwanga or 100 km south of Dease Lake on Highway #37. History: Kinaskan Lake Provincial Park was established on December 4, 1987. Conservation: Special features in this park include Cascade Falls, Natadesleen and Kinaskan Lakes, and Natadesleen and Kinaskan Rainnbow Fisheries. Wildlife: A diversity of wildlife is seen and includes moose, black and grizzly bears, wolves, coyotes, mink, martens, hares, and squirrels. Goats and Stone sheep can also be seen high in the nearby mountains. Feel free to canoe at both Kinaskan and Natadesleen Lakes. Rainbow trout are abundant in Kinaskan and Natadesleen Lakes, averaging .5 kg in weight and 30 cm in length. Fish from shore or boat, fly fish, cast, or troll with just about any lure, the hard-fighting rainbow are waiting. Anyone fishing or angling in British Columbia must have an appropriate licence. Several trails are located near Kinaskan Lake. The Todagin Mountain trail leaves Highway 37 several hundred metres south of the Tatogga Lake service station and leads to the summer range of the Stone Sheep. A full day or two should be allowed for this hike. The Mt. Edziza trail begins on the west end of the campground and leads about 300 metres to where the Iskut River must be crossed. From the western shore, the trail leads through an old burn and onto Mowdade Lake at 24 km and the start of the Mt. Edziza Park trail system. The Natadesleen trail leaves Highway 37 ten kilometres south of Kinaskan Lake. This trail leads 1 km to the shore of the Natadesleen. The adventurous can portage a canoe into Natadesleen Lake and paddle to the southwest side of the lake, where the river exits the lake. From here, a rough trail leads down the river to Cascade Falls, a unique volcanic formation on the Iskut River. The floating wharf and excellent boat ramp make it easy to launch your boat.